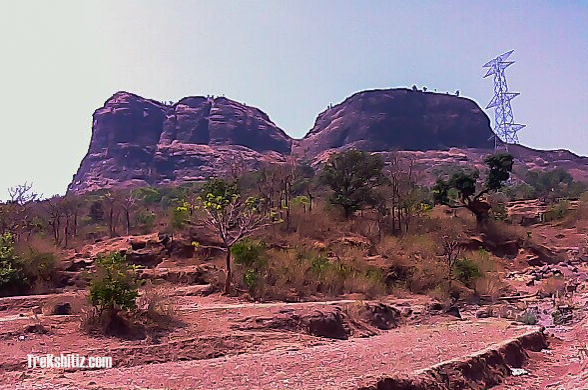 The Balaghat mountain range of the Sahyadris cuts across Pune, Nagar and Nashik districts. There are many forts, ghats/passes nested in this range. Malshej ghat, Daryaghat, Naneghat, Sakurdighat, Harishchandragad, Kunjargad, Pabargad, Kallagad, Nimgiri, Hadsar, Bhairavgad are located here. Nimgiri and Hanumantgad forts are located opposite to Harishchandragad fort and is known for its rock cut stairs. Nimgiri and Hanumantgad have been separated by a cleft. The ascend to the forts starts from the middle of these two. Keep ascending towards the electric tower which is across the ground of the primary school. As we proceed to the upper level of the tower we come across broken patches of farms. To the left side away from the path we can see a beautiful idol and remains of a temple. There is also a water tank here. Back on the path as we proceed ahead we come across many idols and Veerghals and some scriptures carved on stones. The entrance of Hanumantgad fort and its bastions are still in good shape but its entrance has been covered by mud till its arch. Proceed to the right alongside the fort wall where we come across a huge water tank. After this ascend the hill to find remains of house structures. Further there is a plateau to the left with three water tanks on it. While heading back towards the entrance there is a dried up water tank at the lower side of the structure remains.